The PHIX and the JUUL share some similarities, including their appearance and the fact that both spell their names in capital words. While one has been around for years and the other one is relatively new, both pod mods have interesting things to offer. One is cheaper and can be a good solution for people who want to spend less, while the other is set to be the original option that gets a lot of attention. Here we will take a look at both to help you decide which one is the right option for you. But first, let’s talk about the popularity of pod mods, which has increased thanks to the convenience that they offer. They are very easy to use and have become a favorite vaping option for many people around the world. There is no refilling required so they are ideal for use on the go. 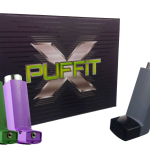 Since they have a high amount of nicotine, you only need to take a few puffs to get a satisfying vaping experience. 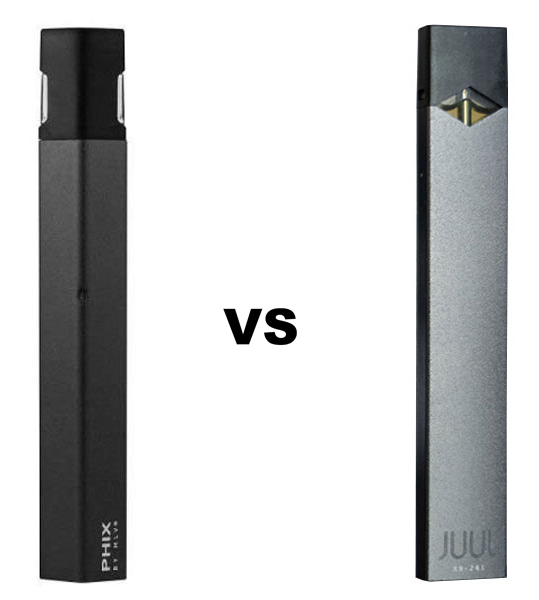 Now, let’s find out the differences between the PHIX and the JUUL so that you can decide which one is right for you. These two devices offer good quality so the price is an aspect that will become crucial for many people when they choose between them. The PHIX starter kit is available for $34.99 and it included one pod. The JUUL starter kit is more expensive ($49.99), but it comes with four pods. This gives you good value for money since a 4-pack of JUUL pods costs $31.98, unless you are in the auto-ship plan. If you are in the auto-ship plan, a 4-pack of JUUL pods will cost you $27.18 on auto-ship. You get 0.7ml of 5% nicotine e-liquid in each pod. In order to save money, it is a good idea to opt for the auto-ship plan if you use the JUUL on a daily basis. Although the PHIX kit only comes with one pod, it ends up being cheaper. This is because a 4-pack of pods costs $22.99 and each one of them gives you 1.5ml of 5% nicotine e-liquid. If you are looking for the most affordable option, the PHIX is the right choice. Not only the kit and the pods are cheaper, but you also get more e-liquid. In this category, the JUUL gets ahead thanks to its appealing looks and solid design. Compared to the JUUL, the PHIX looks and feels less attractive and comfortable. Its diamond shape makes awkward, while the JUUL features a stylish design and its rectangular shape makes it easy to carry and to use. It looks more like a regular cigarette, which makes it a better solution for those who are making the transition from smoking to vaping. The JUUL is the way to go if looks matter to you and you want a device that resembles a cigarette and that is easy to use. When it comes to battery life, both the JUUL and the PHIX offer similar results. However, the PHIX gets ahead thanks to its 280mAh battery, which goes beyond the 200mAh battery of the JUUL. If you enjoy the flavors that PHIX offers, you will be able to enjoy a better and more extensive vaping experience. The JUUL will need to be charged more often, but you can vape the PHIX all day, if you are a light or medium user. The JUUL comes with a battery light indicator that is very handy. All you need to do is to tap the battery twice and the indicator will light up in red, orange or green, so you will know what is the status of the battery. One thing to keep in mind is that both devices have proprietary chargers, which can be a hassle as it gives you less flexibility to charge them. 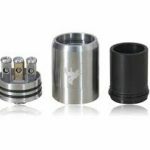 The JUUL uses a NiChrome coil and the PHIX uses a ceramic coil system. While ceramic coils can offer an interesting experience in a pod mod, in the end what really matters is how enjoyable is the vapor from each coil for you. One of the main advantages of ceramic cols is that they last longer. The other one is that they prevent dry hits from getting a burnt taste. When it comes to pod mods, there is no need to worry about the coil not being saturated or about having ultra long-lasting coil. In the end, the choice depends on your preferences. You need to decide if you prefer the vapor from a ceramic coil or from the NiChrome coil. Both the JUUL and the PHIX have a limited selection of flavors, in each case, there are only five options. PHIX’s flavors include spearmint, ice tobacco, butterscotch and hard strawberry. JUUL has options like virgin tobacco, mango, creme brulee and fruit medley. If you prefer tobacco flavors, the PHIX would be your best option, while the JUUL has a great menthol flavor, as well as enjoyable fruit flavors. If you want a device that offers sleek looks and high technology, the JUUL is for you. It is the leading choice, not only due to its appearance, but also its overall performance. In fact, it can be said that the JUUL is the standard that other devices of its kind try to copy. In addition, the JUUL offers a throat hit that is more similar to what you get with a cigarette. The PHIX is one of the options that come closer to the JUUL in terms of performance and it is also cheaper. Its main issue is its design, which can be uncomfortable and difficult to get used to for some.